dobacteria (B. breve, B. longum*, B. infantis*), lactobacilli (L. acidophilus, L. plantarum, L. paracasei, L. delbrueckii subsp. bulgaricus**); maltose; cornstarch; anti-caking agent: silicone dioxide. Recommended use: The recommended daily dose is 1-2 bags (450-900 billion bacteria). Dissolve contents in water, yoghurt, apple juice or any other cold, non-carbonated drink and consume immediately. Do not exceed the recommended daily dosage. In individual cases, bloating may/might occur during/in the first days of use; this is a normal nutritional occurence. Product presentation: 30 bags of VSL#3® per box, 4,4 g per bag. This product does not contain colouring agents, preservatives nor synthetic sweeteners. Storage: If unopened and stored refrigerated (2-8 °C), VSL#3® is guaranteed through the best before end date. 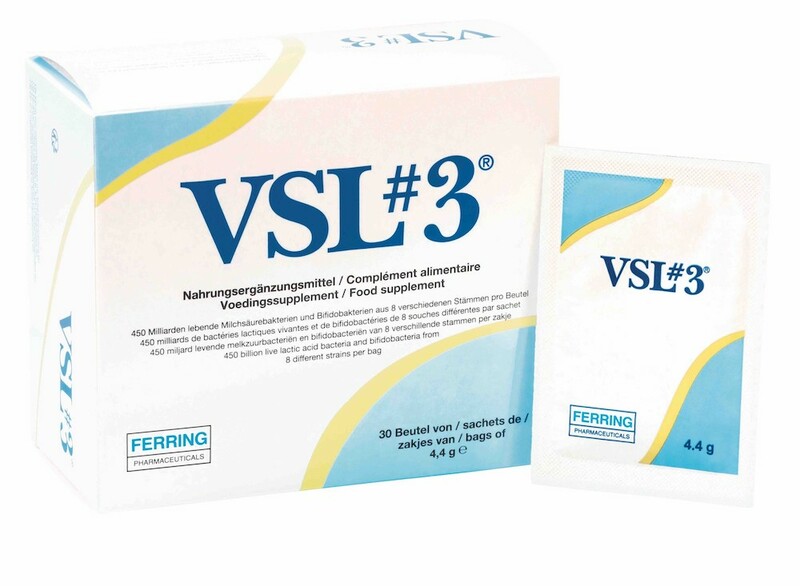 VSL#3® can be stored at room temperature (max 25°C) during maximum 1 week without any adverse effect on the content. Keep out of reach of young children.